Welcome to Extra Board! 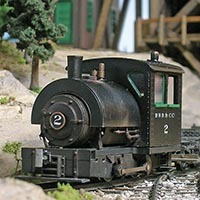 This section is updated periodically with short features contributed by our readers, as well as some recent favorites straight from the pages of the Narrow Gauge and Short Line Gazette. Check back as we continue to add new articles! I got back into model railroading about 12 years ago, after an absence of some 28 years. When I returned to the hobby, I decided that I wanted to create a small HO gauge logging diorama. My modular, “micro-layout,” is an On30 dead-rail model railroad based on the 3-foot gauge North Pacific Coast Railroad that once ran from the ferry terminal at Sausalito, to Duncan’s Mills, and Cazadero, California. The digital/decoder revolution has changed our hobby. 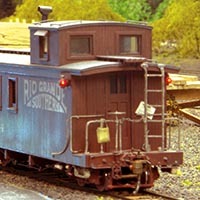 I now have six Rio Grande cabooses, and one Denver & Rio Grande Western caboose fitted with LED marker and cupola lights. 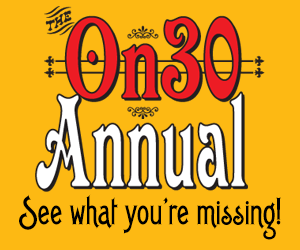 When I examined my information on Bell Locomotives, I realized that the running gear of many Bell Locomotives bore a striking resemblance to that of an On30 Bachmann Industries Davenport gas-mechanical. 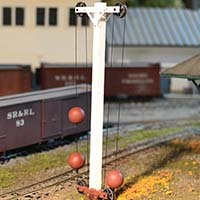 Ball signals were used to protect track crossings and yard movements on many 19th Century railroads, and well into the 20th century on some. The Sandy River & Rangeley Lakes had ball signals at Farmington, Strong, and Phillips. By using models from one scale and track components from another, you can achieve the effect you’re looking for. 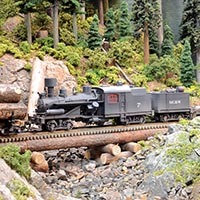 Many hobbyists choose to work in O scale, where the larger models have more “heft” and opportunities for showing off detail that would otherwise be lost in a smaller size.